order to deceive the authorities and the public, Thrax makes his way through Franks body. 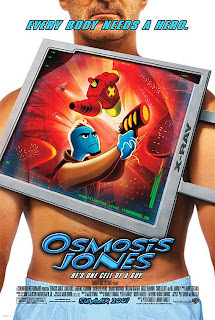 Accompanied only by "temporary relief of symptoms commonly associated with flu" cold tablet Drix, Osmosis Jones suspects that there is more going on than just a simple flu. Meanwhile, Mayor Phlegmming is much more interested in his re-election than in real problems and tries to keep trouble down. So, it is up only to Drix and Os to stop the "red death" from making Shane an orphan.